This article updated 15 June 2018 with the addition of the London Combination table and commentary thereon. Arsenal played five games in May, the home and away league games against Liverpool and three friendly games. It was also a month in which an interview with the manager Leslie Knighton appeared in a magazine and Manchester City allegedly made a move to have their old assistant manager (Knighton) back, as manager. We’ll unravel it all – and believe me as it goes on it makes for a fascinating tale. The month began with the final home league match – a goalless draw against Liverpool. The result was Arsenal 0 Liverpool 0. This game on 2 May was also the last game for John Peart. It was his one and only appearance at right back and his only game of the season. Peart was in fact a left back who was born in Tewskesbury in 1887, and who played for Woolwich Arsenal coming up through the reserves to break into the first team in the 1910/11 season. His first game was on March 11 1911 against Everton at home in front of 10,000. Arsenal won 1-0. However after losing his place in the 1912/13 season (the season of Arsenal’s relegation) and having played 16 games – including one at centre forward (which might seem bizarre in the 21st century but was far more common 100 years ago), he then left the club to go to Croydon Common FC of the Southern League. His final appearance before the Croydon Common move was against Sheffield United on 18 January 1913 at the Manor Ground in front of 6000. Coincidentally his next game was also against Sheffield United on 13 March 1920, playing for Arsenal, which Arsenal won 3-0 in front of 35,000. Quite a contrast. By the time he returned to Arsenal after the war Croydon Common had become the only Southern League club to fold during the conflict, and indeed he was one of several CC players who found their way to Arsenal during the conflict. After this game Peart moved to Margate. On 3 May a further development took place in Ireland as the province of Northern Ireland was created within the United Kingdom under terms of the Government of Ireland Act 1920. The following day the IRA killed a former Royal Irish Constabulary inspector in Glasgow. The next day Arsenal played a friendly – one of three end-of-season games, this against Wigan Borough, which Arsenal lost 2-1 in front of 3000. Wigan were one of the clubs that had been elected into the new 3rd Division (North) and were clearly looking to get in a few games as they prepared for their entry into the League. On Thursday 5 May Sir Henry and Edith Norris attended the dinner organised by West Kensington and Fulham Tradesmen’s Association and Sally Davis tells us that the Norris family sat alongside the Gentry family – Mr Gentry being the Labour politician who had ousted the Conservatives in Fulham in the last election. It may simply have been the formal seating arrangements, but it is also possible that Labour had realised just how closely allied their position in terms of workers rights and the rights of returning soldiers were, to those of Sir Henry. Also on this day we had the occasion of the match written up in many football history books as the match with the lowest ever attendance in Football League history. However as with so many football stories of this nature, a little digging reveals that something was going on behind the scenes that explains the bizarre tale of just 13 people going to this game. The match was between Stockport County and Leicester City. Stockport were fighting against relegation from Division 2 to the newly formed 3rd Division (North) from which promotion would be extremely difficult – it being limited to just one club each year. And the first thing we notice is that it was not played at Stockport’s ground but at Manchester United’s Old Trafford ground. The story begins with Stockport County playing Sheffield Wednesday at the Edgeley Park ground on 2 April. Stockport were losing 0-1 when the referee turned down their appeal for a penalty. There were what were euphemistically called “crowd problems” and ultimately the crowd turned on the ref and attacked his dressing room at the end of the game. It was an event similar to one at Woolwich Arsenal in Arsenal’s early league career which led to the order of a ground closure. In this case Edgeley Park was closed just for the final home match of the season (no club ever got punished as much as Arsenal had been in 1895) and by the time the game came around Stockport had been relegated. This explains the fact that the game was played at Man U’s ground and the smallness of the crowd, but still it was not the 13 spectators always quoted. The fact was that the game was played immediately after the match between Manchester United and Derby County in the First Division and anyone who entered the ground while this main game was in progress was counted as paying to see Man U’s final match. What’s more, as always happened, with some 15 minutes to go, the main doors were opened so that those wishing to leave before the end to “avoid the rush” (it was the same then as now) could just walk out. This meant that any Stockport fans turning up could also walk into the ground through the exit gates. It seems that 13 fans chose not to do this and dutifully paid to enter the ground after the Man U game had finished via the official turnstile. In fact many of the people who had turned up for the Man U game stayed on and watched the Stockport game without paying and newspaper reports speak of a crowd of about 1500 at the game. It ended in a goalless draw. Meanwhile on the industrial front, by the time of Arsenal’s final game on 7 May the striking miners were coming back to work and the trains were running fairly normally. Not that this helped Arsenal on the pitch – they lost 3-0. At the same time (at least I think it was at the same time!) at Highbury the Arsenal reserve team played the Athenian Football League XI and drew 2-2. There were thus no last minute dramas, as the relegation of the bottom two had been certain for a couple of weeks, as had Burnley’s league title. It was the first of two League titles for the club (the other coming in 1959/60) but not their first trophy. They had won the FA Cup for the first and only time in 1914. Arsenal’s season was probably considered quite satisfactory – they had ended up in the top half of the league and had established themselves as a solid first division club that attracted decent crowds (I shall deal with the crowds for the season in the next piece) but there is something else that might well have been noted by the management. Arsenal were the sixth best team, which means that it was their form at Highbury that was causing the problem. Quite why this was I don’t know, but it is interesting to speculate that even in these days the crowd could get on the team’s back. Certainly Chapman felt this in the later part of the decade and he complained about the Arsenal fans several times in his column in the press. This was as before an all London league with each teams playing each other four times, twice at home and twice away. At some stage during the summer Queens Park Rangers applied for a place in the league and were accepted for the next season, taking the club total up to 11. In 1923/24 Southend United also joined. There was no promotion or relegation from the league. Away from football, on 7 May the Scottish Union of Dock Labourers broke from the formal policy of the Transport Workers’ Federation and called a strike as wage cuts were imposed on merchant seamen. A general strike in the docks followed and lasted into June. The NUR and NTWF however did not support the strikes citing the high levels of unemployment which meant non-union labour would always be willing to work for lower salaries. Back with the football Arsenal meanwhile had two friendly games to play. First on 9 May there was a game against Southend United for the Southend Hospital Cup which Arsenal won 4-0. The cup donated by the Southend director, E T Smith. The money raised was divided between hospitals in Southend and the Great Northern Hospital on Holloway Road, Hornsey, which was the nearest hospital to Arsenal’s ground, and presumably the place to which players with serious injuries during games were taken. And then on 11 May Arsenal played against Clapton Orient this time for the Metropolitan Hospital Cup, a game which Arsenal won 2-0. In both cases Arsenal put out a mix of first team players and reserves. These games completed the matches for the season and the details are below. I have not included the game that probably took place on 7 May as it was marked as an Arsenal XI meaning basically the reserve side. On 24 May elections were held in Northern Ireland for the newly formed Parliament with the Ulster Unionists not surprisingly winning the vast majority of seats. The following day the IRA occupied the Customs House in Dublin which was the centre of local government in Ireland. 80 IRA men were captured by the British Army which surrounded the building. Five IRA men died. Back with the football, at this point things become decidedly murky. Now this is odd because Manchester City had just had their best season for several years, finishing second as we have seen above. More odd was the fact that their manager Ernest Mangnall had been with the club since September 1912, and was a manager with a pedigree for he had previously been with Manchester United and had won the 1st division twice and the FA cup once with them. This past season, with City finishing second (their best performance since 1910) it appeared as if he was now delivering at City what he had done at United. We may ask exactly why Manchester City would want to bring back their previous reserve team manager whose experience of first team management had been a couple of mid-table finishes with Arsenal. Also we may note that Mangnall didn’t leave Manchester City – it was not as if he was retiring or had decided to move elsewhere. Having just had his best season with City he stayed on until 1924. Indeed he was still in his 50s – not the normal retirement age in football management. Moreover, Mangnall was deeply involved in the move of the club from Hyde Road to Main Road, a ground that proved very popular with the fans and brought in ever larger crowds. In 1922 Mangnall announced the move personally calling the new ground the “English Hampden” on the Moss Side/Rusholme border. Mangnall had joined City in 1912 – joining from Manchester United the first ever manager to leave a major club for its rivals. Even more amazing Mangnall agreed to become Man City manager while still manager of Man U and it is reported that he watched Man City’s opening game of the 1912/13 season at Notts County when he was supposed to be with United at Arsenal. His final match was the Manchester derby of 7 September 1912 at Old Trafford. So my question is, is it likely that Knighton was really offered the job of manager in place of the man who had just taken Man City back to second in the top division, and who had just engineered the move of City to the largest league ground in the country? A man who was a local hero for City fans having left Manchester United, and who had a proven pedigree of titles. In fact there are two questions. Would Mangnall leave Manchester City at this time, and if so would the club turn to their erstwhile assistant manager who was doing ok with Arsenal, but hardly knocking the rest of the first division out? Now the only source for this story is Knighton’s autobiography, which as we have seen with issues such as the use of Dr Paterson, is “muddled” to put it at its best. And what follows is even stranger, for according to Knighton’s account Henry Norris did everything under the sun to keep Knighton at the club. The story goes that he offered Knighton rent-free use of his flat (which he used when Parliament was in session); a contract for a further three years and all the take from the Arsenal v Tottenham game as a benefit, if he would stay for another three years. a) Was there a vacancy at Manchester City? I think almost certainly not. b) Did Sir Henry Norris go out of his way to keep this man at Arsenal when there were always other managers around looking for jobs? I can’t see that. c) If Sir Henry did really desperately want Knighton for some reason we can’t understand would he have offered the entire take from from the Arsenal v Tottenham game? And indeed why that game, three years ahead. No one knew if both clubs would still be in the same division, nor when it was going to be played. In fact it was the very first match of the 1925/26 season – but of course Knighton and Norris would not have known this three years earlier. Yes, having the gate money of that match which was the first game after Knighton left would have been a reasonable offer in 1925 if Sir Henry wanted to be generous. But to offer that three years beforehand only to find that by chance it was the first match after Knighton left? It seems unlikely. So I am now very doubtful, but there is more to be found because in June Knighton did an interview with a football magazine which casts further light on the man and his thoughts at this time. But first I must conclude May, and on 30 May 1921 the AGM of the Football Association was held in London. During the course of the day it was proposed to explore the possibility of holding the cup final at Wembley. Around this time Sir Henry and William Hall discussed how they were going to start getting the money back from Arsenal, that the club owed them. They decided that one way to start getting the money was to put themselves on the books of the club as employees and have the club pay their chauffeur’s wages. Now you are quite possibly used to hearing that this was an utter outrage, a scandal, a fraud and a cheat, but arrangements such as this, putting directors down as employees and the like is utterly every day in limited companies, and always has been. I can assert as a director of a couple of companies and having been a director of two others in my career, that as a company director one always looks for the most efficient way of earning money from a company. I have worked hard for all the companies of which I have been a director, but have only taken salaries from three of the four, simply for tax purposes. Tax laws are so complex that it can often be that if one takes money from the company as a dividend one pays a lot more, or a lot less tax, than if one is an employee (depending on the regulations at the time). Likewise one may have been taking legitimate expenses (for example the cost of petrol to get to business meetings) only to find that the latest tax rules say that can’t be done, so the money is taken in another way. It is all perfectly legitimate, not least because the directors can direct the company to pay money as and how it wishes as long as it is within the law. The decisions Sir Henry and Hall took at this time were thus the decisions that directors take all the time and were within the law. Ultimately it was found that it was a decision that broke League rules and that was a mistake by both men, but equally it was not (as is oft reported) what caused Sir Henry to leave Arsenal. At the same time work began on replacing the roof of the grandstand at Highbury, the first serious ground improvements since the war. One presumes water was leaking through onto the head’s of the patrons in the more expensive seats. Now I want to stop at this point. 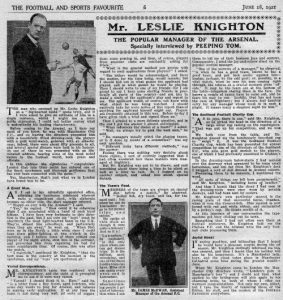 Knighton was assistant manager to a very high profile manager – the man who as noted above was the man who had won trophies with Man U and then famously walked out and joined their neighbours for whom he engineered the move to the largest ground in the country. Is it likely that he would get 50 presents of such high quality upon leaving? Certainly there is no sign that the interviewer saw these gifts which if real were certainly of some magnitude. The interview, very fawning by today’s standards, took place in “Knighton’s splendidly appointed office”, (presumably at Highbury). So has he actually installed all these mementos of his time as Manchester City deputy? It all seems unlikely and there is nothing here to suggest the interviewer saw all these items. Quickly the piece goes on to talk about the fun and games of being a footballer – the “ragging” of a player (we would call it bullying) involving dragging him from his bed, removing his “night attire” and leaving him naked in the corridor. Knighton thinks it amusing as does the interviewer – although to be fair, it was part of the spirit of the age. As for his recruitment of new players (something Knighton attacked Norris for at great lengths in his autobiography some 20 years later) he talks of having “sterling friends in all parts of the country” who act as scouts and send in written reports. No mention of having to work in a budget, of having his network of scouts wound up, which is what he alleged repeatedly in the autobiography. Later it says that when Knighton came to London the Manchester directors saw the change as London’s gain as Manchester’s loss. Undoubtedly a pleasantry but not to be taken literally. The manager also mentions he has just got married to a Manchester lady. So let us consider Knighton’s career thus far. He was caretaker manager of Huddersfield Town in 1912, and thereafter assistant manager at Manchester City from 1909 to 1912 and then again from 1912 until 1919 when he signed for Arsenal. So we might ask, what about his managerial experience at Huddersfield Town? In fact it was just one match, for he was caretaker from 24 to 27 April 1912 – the end of the season. True they won that match, but I am not too sure that qualifies as really being a manager. So there we have it. Was Knighton a man who was a great self-publicist? Quite possibly. Was he a fantasist? That might be going a bit far, but the 50 presents when leaving seems a bit unlikely. But did he get offered the job of Manchester City manager when the incumbent was so well known, such a strong force, in the middle of moving the club and so loved at Man City for having left the local rivals? No, I really, really don’t believe that. I think from this early stage Knighton saw himself as a big player, and that in his retirement after the second world war he sought to justify his failure at Arsenal in the three years of his service at the club which we have yet to cover. These tales of presents, and later of Sir Henry’s desperation to keep him… no I think they are the work of a man who subsequently to the season we have covered here, took Arsenal to the very edge of relegation, as we shall see. As such I believe we can dismiss all these claims about Sir Henry reneging on the benefit match, and offering his Parliamentary apartment etc. The simple question is, why on earth would he make such offers? Knighton was in his first job as manager and had stabilised the club. And we already know for sure that Knighton made up the most outrageous tale about Dr Patterson. I think we have more of the same here. And I would give one more bit of evidence about Knighton’s ability to exaggerate. In the interview reproduced above he says this. Yes, he picks out the cup, and fair enough Arsenal won it. By beating Southend United in one match. That is what he picks out. On its own maybe that’s not much of a pointer to Knighton’s personality, but put with other matters, I think it tells us something. One last event for the month. On 28 June 1921 Reg Boreham joined Arsenal from Wycombe. Although Bernard Joy said of him “His sparkling displays nearly gave him an England professional cap as well as amateur ones,” we know little of him save for the fact that he played 53 games and scored 18 goals for Arsenal. We’ll deal with these later. Perhaps the most popular element in the Norris story is that of Arsenal’s promotion to the first division in 1919. The most complete review of this, which puts right the numerous misunderstandings of the events of that year appears, and most importantly cites contemporary articles and reports, such as the minutes of the FA meeting where the promotion was confirmed, and the reports in local papers thereafter, here in these two sets of articles. Below that, the further evidence we have that Knighton’s assessment of Norris is not to be taken at face value. This is the Fourth Allegation, and like the others, I think it falls flat on its face. 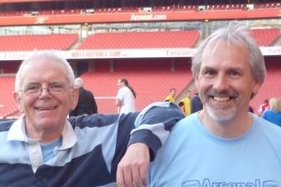 Henry Norris at the Arsenal: the full story (so far).